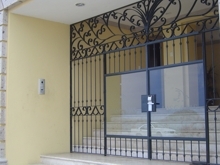 For your relaxation, we have controlled all accesses with security locks that can only be opened by the owners of Las Gavias. Security Watch Security Booths are located in main entrances with on duty guards 24 hours a day and closed circuit cameras. Security Cameras Parking entrances and exits on Main Street and Exit Street have automated gates. All locks and entrances are controlled with electronic keys. Electronic Keys Are installed on all condominium doors and main entrances to allow access only to owners.